This time of year, Easter time, lots of grocery stores have had hams on sale and lots of people enjoy ham on their Easter table. That's wonderful and all, but any one else have the issue of always having leftover ham? You can only eat so many ham sandwiches before tiring of it- am I right? You can go to the search bar here on my blog and search "ham" and find lots of recipes I've shared here using ham, but this one... this one is MY FAVE!!!! The recipe is super simple and one you've had a million times, just with ham added. Macaroni and Cheese with chopped up pieces of ham. SO SO good!! I remember my mom doing that a few times for us growing up and I LOVED IT (thanks, Mom!!!!). This is how Mr. U and the girls now prefer their mac and cheese- with ham. So here's how I make ours. Oh, and the sauce is based on another recipe I shared before using cauliflower. This recipe would SOOOOO work with cauliflower, too!!!! Cook pasta according to package directions. Drain. Set aside. While pasta is cooking, add milk to a large pot (I used my 6 qt stock pot) and heat just until it starts bubbling around the edge of the pan. Then add the cream cheese and whisk until it is all melted and dissolved. Then whisk in the dijon mustard, pepper, and garlic. Then add in the cheese and slowly stir until it is all melted and combined. Finally add the cooked pasta and chopped ham to the pot and mix it all together. Pour into a prepared 9x13 and bake at 375 degrees 20 minutes. I love that you used the leftover ham to use in the mac and cheese. Oh Katie! Trust me on the mustard. It’s just a little bit and it makes he cheese flavor POP! So yummy! What a delicious way to use leftover ham, Mrs U! Good combination of flavors. One of my go to ways to use up ham. We like to so well that I will dice leftover ham to freeze so I can make this meal at a later date. I haven't made homemade mac 'n cheese for years. This looks delicious! Love it! This is one of my family's favorite meals. I wonder if they'd like it with ham . . .? Delicious comfort food! Thanks for linking up to the Friday Frenzy! Didn't make a ham this year but I've pinned this for when I do! Cheers and thanks for linking up to the Friday Frenzy! 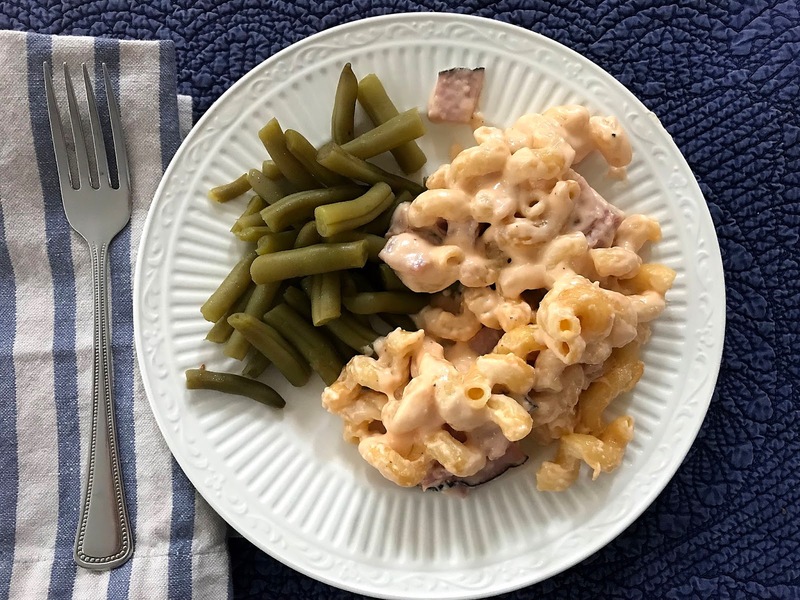 What a great combination of Mac N Cheese with Green Beans, looks so good! Hope you are having a great week and thanks so much for sharing your awesome post with us at Full Plate Thursday!